Scotland winger Alex Hurst remains without a club for the 2014 season. 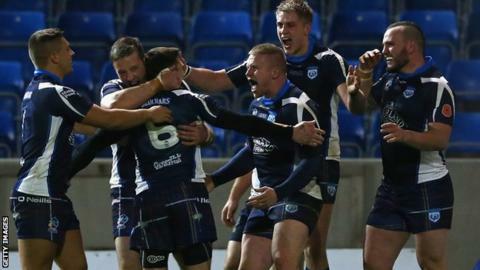 The 23-year-old played all four games for the Bravehearts at the recent Rugby League World Cup, scoring tries against the USA and in their quarter-final defeat by New Zealand. He was released by Super League side London Broncos in November. "I'm keeping fit doing my own stuff, but it's hard to keep that going to the level required," said Hurst, who played rugby union for England Under-16s. "I've had some enquiries from a couple of Championship clubs but none of them were right for me at this stage of my career. "I would love to play in Super League again but wouldn't rule anything out." As well as training on his own, he has been coaching sport to after-school clubs. Hurst previously played rugby union for Sale, Fylde and Sedgley Park and rugby league for Salford and Swinton. He made his Super League debut for the Broncos after impressing coach Tony Rea while playing for Scotland at the European Cup last year. However, he lost his place in the side and went to partner club London Skolars, where he ended up playing in the Northern Bowl Final.